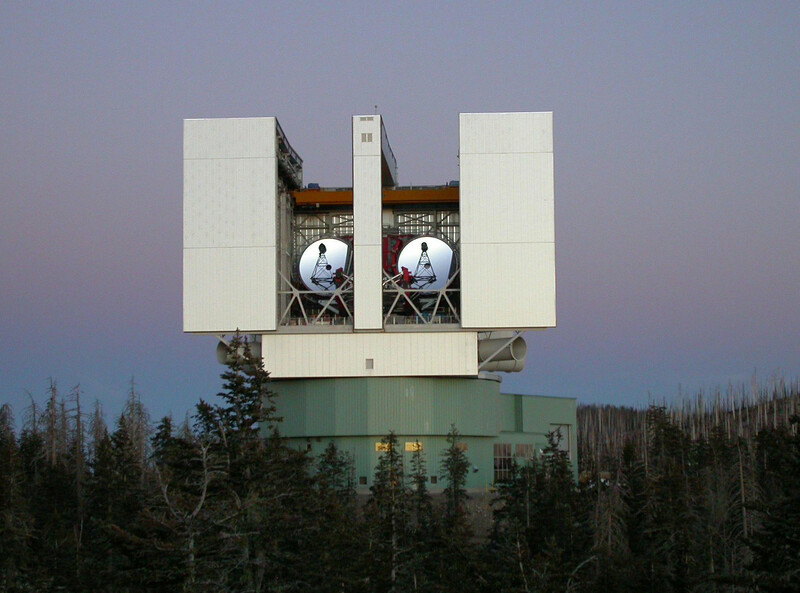 LBTI Completes First Study of Dust in the "Habitable Zone"
The Large Binocular Telescope at Mt. Graham, Arizona. The Large Binocular Telescope Interferometer has completed its first study of dust in the “habitable zone” around a star, opening a new door to finding planets like Earth. The findings will help in the design of future space missions that have the goal of taking pictures of planets similar to Earth, called exo-Earths. The new instrument, based at the Large Binocular Telescope Observatory at the top of Mount Graham in southeastern Arizona, will obtain the best infrared images yet of dust permeating a star’s habitable zone, the region around the star where water — an essential ingredient for life as we know it — could pool on a planet. Earth sits comfortably within our sun’s habitable zone, hence its glistening surface of oceans. Scientists want to take pictures of exo-Earths and break up their light into a rainbow of colors. This color information is displayed in plots, called spectra, which reveal chemical clues about whether a planet could sustain life. But dust — which comes from colliding asteroids and evaporating comets — can outshine the feeble light of a planet, making this task difficult. The Large Binocular Telescope Interferometer (LBTI) instrument set its eyes on a dusty star system called Eta Corvi, depicted here in this artist’s concept. 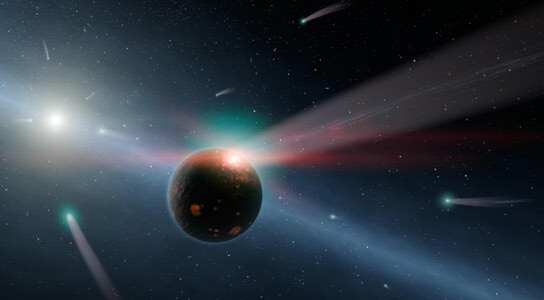 Recent collisions between comets and rocky bodies within the star system are thought to have generated the surplus of dust. A previous NASA project, called the Keck Interferometer, had a similar task of seeking out this dust, finding good news for planet hunters: The stars they observed didn’t seem to be all that dusty on average. LBTI is taking the research a step further, more precisely quantifying the amount of dust around stars. It will be 10 times more sensitive than the Keck Interferometer, and is specially designed to target a star’s inner region — its sweet spot, the habitable zone. The new study reports LBTI’s first test observations of stardust, in this case around a mature, sun-like star called eta Corvi known to be unusually dusty. According to the science team, this star is 10,000 times dustier than our own solar system, likely due to a recent impact between planetary bodies in its inner regions. The surplus of dust gives the telescope a good place to practice its dust-detecting skills. The results showed the telescope works as intended, but also yielded a surprise: The dust was observed to be significantly closer to the star than previously thought, lying between the star and its habitable zone. NASA’s Spitzer Space Telescope has previously estimated the dust to be farther out, based on models of the size of the dust grains. LBTI will begin its official science operations this spring, and will operate for at least three years. One of the project’s goals is to find stars 10 times less dusty than our solar system — the good candidates for planet imaging. These survey results will inform designs and strategies for upcoming exo-Earth imaging missions now in early planning stages. The journey to find worlds ripe for life begins in part by following a trail of dust. LBTI is funded by NASA Headquarters. It is managed by the agency’s Jet Propulsion Laboratory, Pasadena, California, for NASA’s Exoplanet Exploration Program office, and operated by the University of Arizona. The Large Binocular Telescope Observatory is operated by an international collaboration among institutions in the United States, Italy and Germany. JPL is a division of the California Institute of Technology in Pasadena. 1 Comment on "LBTI Completes First Study of Dust in the “Habitable Zone”"
Of course, it would be good to get two habitable planets that are near each other, in case anyone has forgotten that part. I know, it could be relative, but nonetheless.